Performance updates were sparse in Malaysia as the teams continue to optimise the 2014 power units. Red Bull in particular have been making large strides in this area but, as seen though the new FOM fuel use graphic during the race, continue to lag behind the Ferrari and Mercedes units in terms of efficiency – Vettel in particular was using a lot of fuel in his pursuit of Rosberg for second place during the later stages. However there were still some notable modifications to be looked at. I expect a monumental amount of changes in Barcelona but for now there will be a steady stream of bits and pieces. It’s hard to determine if McLaren did indeed find the half a second they intended on bringing to the car for Malaysia, but if they did then the other teams found another chunk of performance, too. Although their pace was perhaps hampered by high track temperatures, a condition that the MP4-29 doesn’t appear to suit well to, the car is still very much a base for a long development curve ahead. One such development has been this new nose assembly. This is a logical step which aims to introduce more airflow beneath the chassis and into the splitter/sidepod leading edge area. The main upper wedge segment has been raised, with the mounting pylons creating a wide venturi tunnel as they rise vertically to a greater height before bending 90 degrees. In comparison, its predecessor had more arched pylons. The lower appendage section remains almost identical to the previous specification, although it has obviously been extended slightly to meet the higher upper section. The team must be satisifed with its design in terms of blockage and general efficiency along the centreline of the car to not feel a need to change this. Having said this, there is not much that can be done to the “finger” to gain a significant advantage due to the minimal cross sectional area regulations. The pylons themselves have an intriguing shape, with a slightly more twisted profile than the outgoing ones and an undercut shape where they meet the nose. In combination with the 3 element turning vanes attached to the chassis behind, this setup guides air to more desirable locations: the highly undercut upper area of the pylon allows airflow to splay outwards and around the chassis, whereas the elongated lower area keeps airflow along a straighter path and onto the splitter at high velocity. 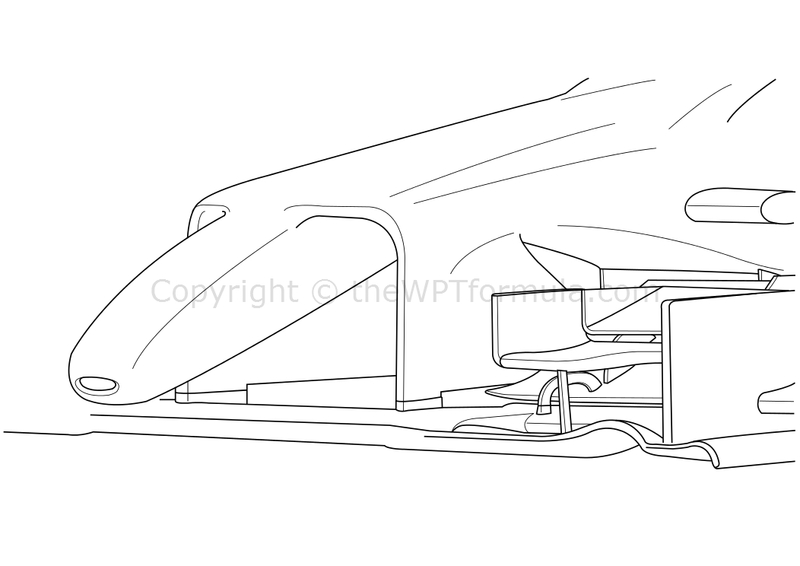 In addition, ridges have been implemented where the nose meets the front bulkhead/chassis mounting point. These ridges prevent airflow passing over the top of the nose from spilling into the airflow passing either side of the chassis and have been utilised by other teams (notably Red Bull) for some time now. However, since the chassis itself does not feature these ridges it is quite a simplistic design. 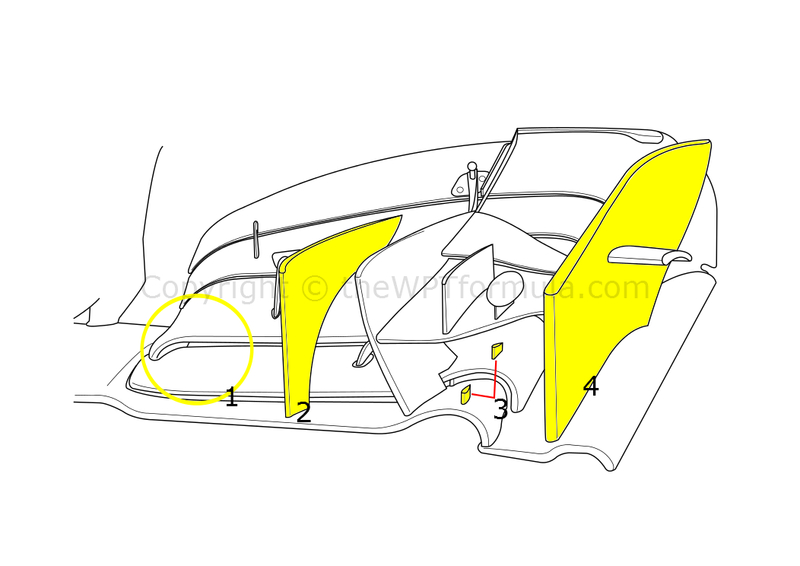 In addition, the team also included a heat outlet along the floor which is similar to the one seen on the Lotus. These extract heat from the intercoolers, heat that has been built up by the extremely hot charge air which is pulled in by the turbo. They also vent latent heat from the ERS battery and wiring. Lotus have stepped up their aerodynamic developments lately with plenty of subtle changes introduced to the E22 since winter testing. 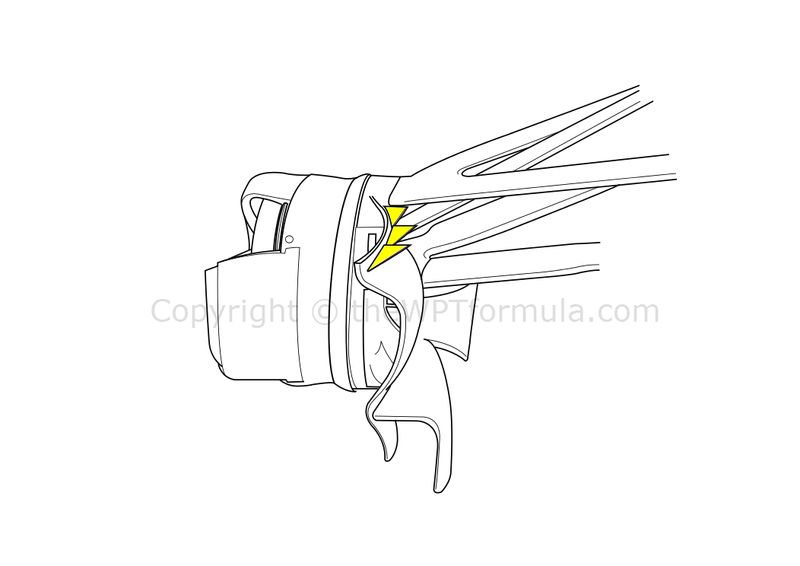 For Malaysia, the brake ducts received some minor treatment in the form of three horizontal ‘shark teeth’ fins. Like the various devices seen next to the cockpit openings, the fins act as airflow management devices to aid other components further downstream. In this case, each fin produces a small vortice at each tip as well as allowing airflow to pass between each of the three profiles (they are in a stepped formation, with the leading find being the highest placed). 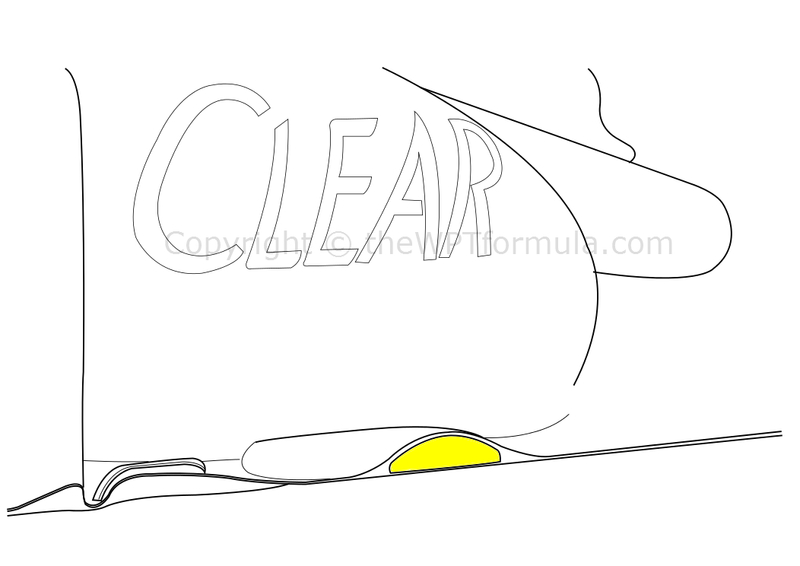 The airflow is then passed into the front tyre wake in an attempt to displace it from the sidepod and floor’s leading edges. These aforementioned regions serve a critical purpose to the car’s overall aerodynamic performance and a lot of work is done to prevent the turbulent flow produced by the front tyre from impinging these areas. Yet more revisions to the W05, although nothing too drastic. 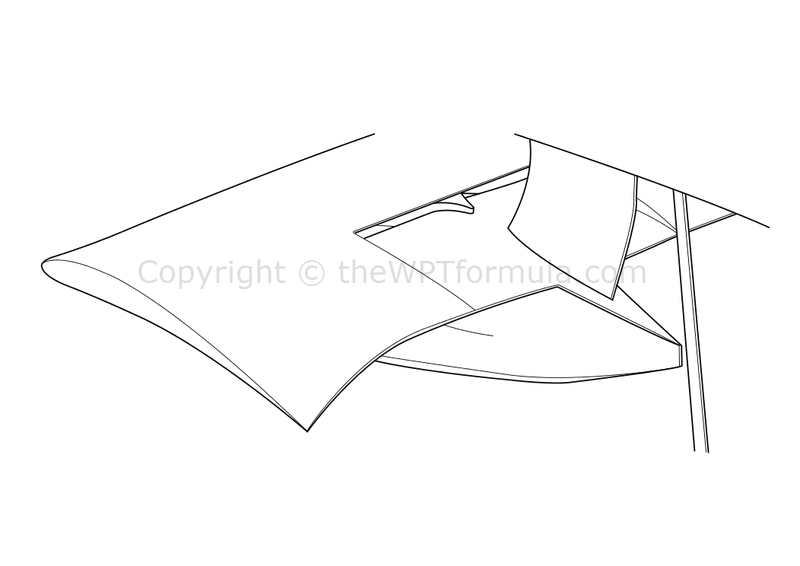 The central section of the diffuser features two triangular Vortex Generators (that sandwich a larger winglet) which are now flanked by small additional flick-ups to extract more lower pressure from the floor below. 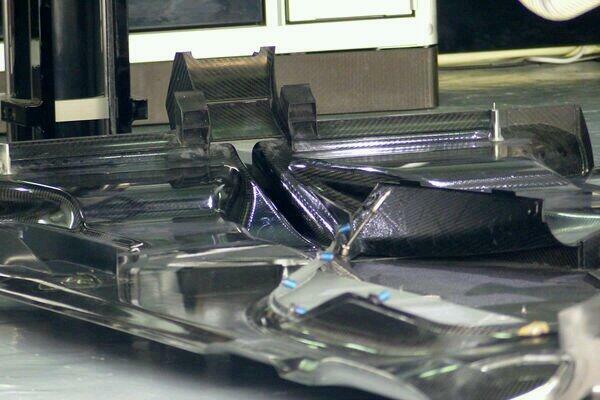 The ‘bat wing’ device, that shrouds the ground speed sensor beneath the chassis, has also been updated. Introduced at the final test in Bahrain, it produces elongated vortices at its tips towards the leading edge of the floor – the ground speed sensor itself can be seen just beneath the wing-shaped fairing at the centre. A slot has been added to reduce lift (and drag) along the middle (the least important part of the device) by bleeding airflow that normally passes beneath the wing over the upper surface. Its profile slopes downwards towards the ground as it takes in high velocity airflow and aims vortices towards the floor. This goes against the conventional ethos of using bodywork that slopes upwards to produce downforce, therefore reducing the amount of lift the wing produces is important. This will also aid fuel consumption. Still no sign of the new nose that has been mooted by highly regarded technical journalists, and the Silver Arrows continued to run with the test specification front wing rather than the one introduced, but not raced, in Melbourne. This entry was posted in 2014 Highlights, Technical Highlights and tagged 2014, 29, analysis, e22, f1, gp, highlights, lotus, malaysia, mclaren, mercedes, mp4, tech, w05 on March 31, 2014 by thewptformula. Thanks! Unfortunately I can’t use proper images because I don’t own the rights to use any but I’m sure there will be an opportunity in the future.